NORAM Turns 30 – NORAM Engineering and Constructors Ltd. It was 30 years ago that founding partners George A.E. Cook and John Rae set up shop in Vancouver, BC. As the story goes, two desks shoved together, two chairs and a telephone became the launching pad of the NORAM Group of companies, that today includes parent NORAM Engineering & Constructors Ltd, and subsidiaries NORAM International AB (Sweden), Axton Inc. (Delta, BC), BC Research Inc. (Richmond, BC), and ECOfluid Systems Inc. (Vancouver, BC). Five partners steered NORAM through its early successes, that would eventually make it a world-leader in its chosen business sectors. 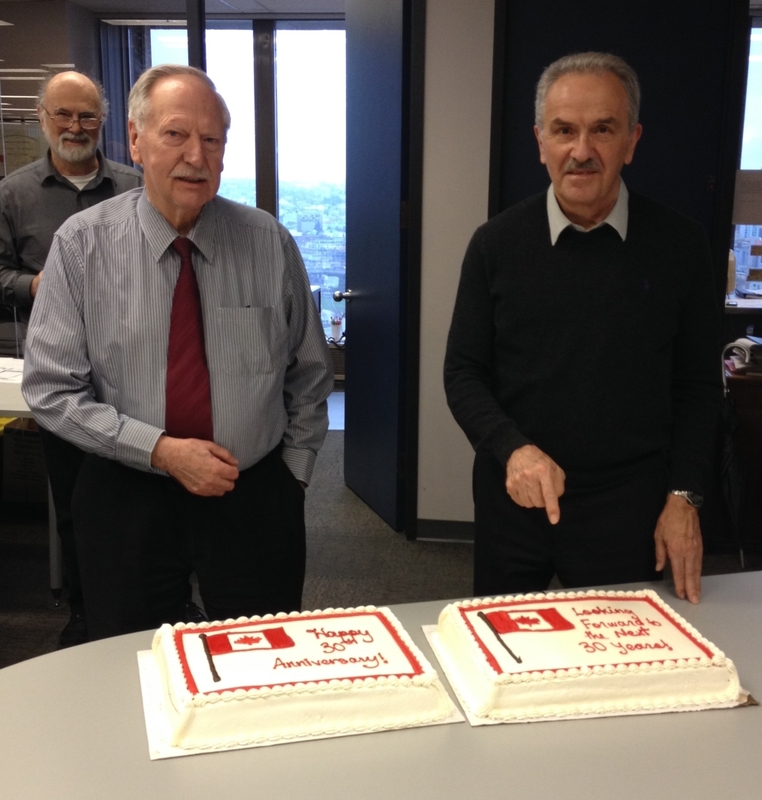 Cutting the cake at today’s celebration, the remaining two shareholding partners had much to reflect back on. CEO and Chairman George Cook said that NORAM was grown from a determination to build a ‘technology company’, giving it a distinctive and near unique position in BC’s engineering community. Alfred Guenkel testified to the sometimes challenging – but fulfilling – milestones that 30 years have wrought. © 2019 NORAM Engineering and Constructors Ltd.